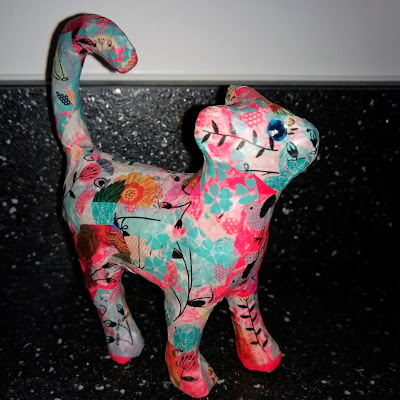 Jessica has turned her hand to decoupage this week. She cut up lots of squares of decorative tissue paper while I was busy doing the washing up then I helped her to stick them all onto the mache cat that we'd bought in one of our many visits to Hobbycraft. We use a mixture of water and PVA glue as an adhesive. She was more than capable of doing most of it independently but I helped with the tricky areas like the tail. Jess chose blue crystals for the eyes and once completely dry I will cover the whole cat in an acrylic varnish to finish her project.